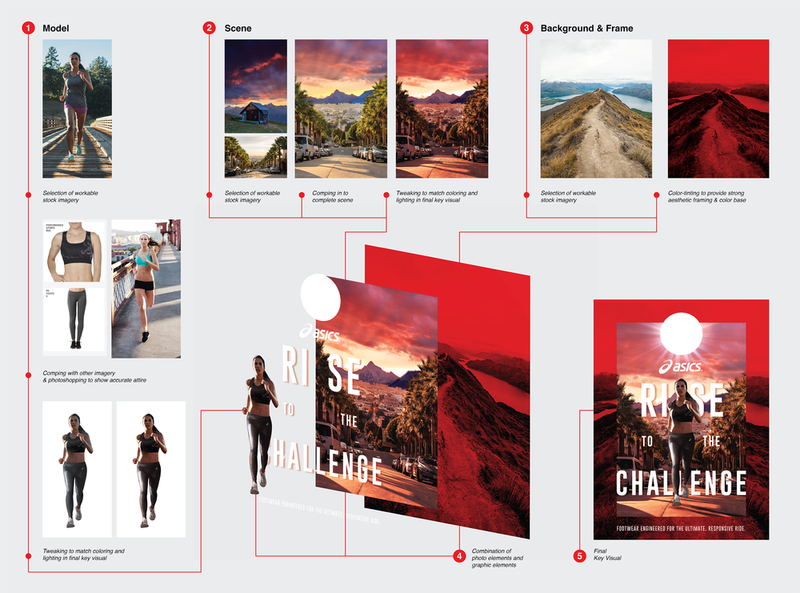 The following is a case study of the complete creative process employed in the ideation and execution of graphics for physical & digital touchpoints across a campaign marketing ecosystem. The work was not executed, but provides a cohesive view of the range of technical abilities and attention to detail I employ under deadline regularly in my career. A holistic understanding of the target shopper, the campaign’s “Big Idea”, and unified aesthetic approach is finalized before design begins. This ensures that all pieces ultimately align to the greater flow of our thinking and presentation to client. Early sketching can solve some design issues before you encounter them, so I try to employ it whenever I can. Coming from a background in illustration greatly facilitates the ability to envision narrative compositions rapidly. I also employ a great deal of quick photoshop comping to get a better feel for some ideas. This process helps to explain the concepts to other team members and allows the group to decide which direction is aligned to the platform best. Design cannot function in a vacuum, and the more alignment that occurs throughout the process, the more efficient our workflow is overall. Ultimately, none of these concepts were used. After selecting the stock imagery most suitable for the composition, significant tweaking had to occur to fully align it with the concept. The woman has the correct lighting and pose, but was in the wrong place and wrong clothing. Her clothes had to be replaced (photoshop) and a stomach added. The setting had to be replaced and was also a composite image. And finally, a background framing device was added to facilitate further graphic treatments. All had to be color treated, edited, silhouetted, and separated to allow for them to function as a group. This image will be utilized in a variety of formats, so it has to be versatile and easily taken apart/reassembled. The same process was employed for the Men’s shoe line, and a horizontal layout was developed for both to introduce more graphic elements utilizing the red framing. A dot matrix and product assortment were included to allow further design elements for cross-pollination in the physical/3D design process, as well as the digital design pieces. 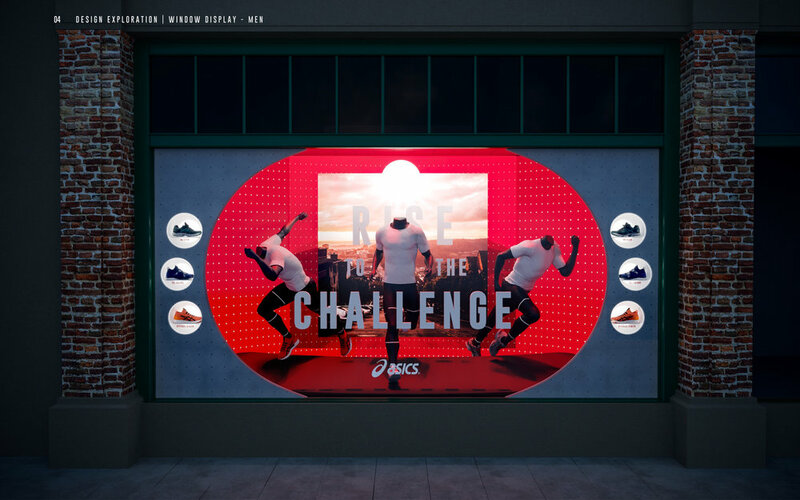 The simplest execution of the platform across the campaign is in exterior settings, which allow for the KV to be printed at various sizes and tied to the retailer to drive awareness. The KV is reconfigured to function as headers in-store, both men’s & women’s. There is also significant collaboration with the 3D/Product Design team members to provide graphic treatments for all signage and panels that aligns with the campaign design direction. Here, the white sun becomes a center light in the category, and the dot matrix is introduced as a design detail across the tables and glass glorification displays. The layers of the KV are effectively used as vignettes in a window display, with the typography in front across the window, the mannequins behind, and scene and red framing used as a backdrop graphic. The white sun is again used as a design detail, this time to glorify the product ranges. An omni-channel strategy demands digital experience, so the graphic treatments developed for the KV were then employed in a “Runner’s App” with multiple functions. Running through this project quite quickly, all screens, copywriting, and app functionality were led by myself. My experience in improvising copywriting and visually connecting disparate strategic project necessities allows me to develop a slew of inter-connected functionalities very rapidly. Ideas are frequently borrowed from disparate sources, cross-referenced with our strategic goals, and combined to propose a more valuable and useable product for the client. The malleability of the key visual is especially useful when applying to broad web environments. Smaller details like smartwatch functionality and the application of communication tying the app to the campaign release were developed as I went. Limited edition shoeboxes and laces were developed in conjunction with product design team members. The key visual is again used as an awareness play on the retailer’s bags, while smaller design details like the translucent red acrylic, letter-pressed dot matrices, and red laces work to cohesively tie all elements to the original 2D development.